My Bedroom Layout Is Giving Me Nightmares - During The Day! Thank you for your email; I expect nothing. I love your blog, and always feel that I learn something new from you! I live in a 1964 ranch-style home that’s only 1400 s/f (3 bed/2 bath). Here are the photos of my master bedroom layout, which I’m working on. It’s only 13’7″ x 10’7″, with two random windows that aren’t even the same size. One window encroaches on the bed, and the other is squashed into the corner near the closet. On top of that, they aren’t even beautiful. They’re kind of fat and squat, and someone replaced the original windows with vinyl. We are planning on replacing the vinyl with windows more appropriate to the home, but we’re definitely not blowing out the brick on the walls to make something more attractive and symmetrical. My original plan had me cutting down the one bedside table to the same height as the other, and painting both white. I was also planning on doing just a single drapery panel on the right side of the bed window, and regular drapes on the other window, to add height and softness to the room. If you created a mood board for me, even with something entirely different from my inspiration, I’d feel like I’d died and gone to heaven! But even if you just nudged me by saying what you think would be the best window treatment option I’d still be ecstatic. I can’t find anything online for my particular situation, because homes like mine always seem to be the “before” shot of the new, stunning remodel done by an architect/interior decorator husband-wife team, hahaha. I received a sweet note the other day from Tracie and she said that she has a small ranch house and is struggling with her master bedroom. I told her it would be okay to send a few photos which she did with the note above. Oh wow! Pretty wall color. I mean, really pretty. And the bed is lovely… but there are some substantial issues. What’s the first problem with this bedroom? Besides it being pitifully small for a master bedroom. Anyone? Yes, in the second row; I saw your hand go up first. The ceiling fan with a light? Bingo. You guys know me! The fan is fine. The fan with a light says tacky in my opinion. The only time I’ve seen this work is with a retro style fan. It’s meant to be fun and well… retro. Otherwise, in a classic design like Tracie desires, the light looks down-market to me. Anyone else having a problem with the placement of the bed in this bedroom layout? I see most of you raised your hand. Plus… our problem child. Those windows. But what are going to do about the bed? Anyone? Yes, in the third row in the DT T-shirt. I bet you have lots of great ideas. “Well, I hope so. I am wondering if the bed could be put on an angle in the corner? Now, here’s where it gets interesting. Laurel spent four hours making a mood board without first putting the room down on paper. I know better, but that didn’t stop me. haha. After I finished the mood board, I thought, well, I better put this down on paper. I had asked Tracie to send me the measurements and then I discovered that the photos lied. Here’s the sketch – a little rough, but it’s all there. The reality of this bedroom is that with a queen-sized bed and placement of the windows, something is going to be sacrificed. But over-all, I do prefer the bed on an angle. Yes, it’s a little tight, but it’s like trying to fit into your skinny jeans in January. And, it’s tight the other way too. Does the bed have to be on an angle? No, it can stay where it is, but it’s going to make it difficult to put up drapes, unless they are pulled to the right side. And then, the window near the closet the drapes pulled to the left side. I’m not going to tell Tracie to get rid of the bed, but being a sleigh bed, it is a little longer than if it was just a standard bed, with a headboard only. The other issue is the night stands. I drew in some small circles to represent two small round tables– maybe two garden stools, just big enough for a drink and a pair of glasses and maybe a small book. We could do swing arm lamps above. I drew in a rectangular table behind the bed but it’s not really practical, except to catch the dust. We can put her other tables in front of the windows, I think. And yes, painting the other table is a great idea. And then, I would add a pretty lamp for each. Tracie’s instincts are right on about the drapes. They should be the same style and even though the windows are different, sizes, we can cheat that a little so that they look to be the same size. I do that all the time. But before I address the design of the drapes, I would like to address the fabric. Tracie loves the buffalo check and I do too. She wrote me that she wants to use this check from Ballard Designs. Here it is on a recliner for scale purposes. It’s very pretty; but here’s the problem and it’s a universal one. Sometimes when we see a room we like and we want to copy it, it may be that there are some elements that really aren’t right for our space. In other words, we won’t get that room. The room Tracie sent me is at least 50% larger with a nine foot ceiling and normal windows. But, I might be wrong. And one other thing. The large check is classic, but it’s also very trendy right now. Just something to consider. Here’s what I would suggest if there’s any doubt if a drapery fabric is the right one. Definitely get a sample, but if the sample is too small, buy a yard of the fabric and hold it up. You can always use it for a pillow or something. Drapes are a really in-your-face-thing and better to get a better sense of what’s in store. In addition, the background of this fabric is cream and believe me when I tell you that it could possible go very yellow when the light shines through it. Always use a white lining fabric for that reason, unless you want it to look yellow. And it might still look yellow, even with white lining. It’s a good idea to hold the fabric up in front of the window during the day to see what happens. I forgot to tell you that Tracie has a pretty tight budget. I did look and Ballard does have ready-made drapes in the buffalo check but in a dark gray, definitely not and a beige and white which is a possibility. She should get the 96″ size and hem them a little. I’d like to suggest a fabric that’s the same color as the wall. I love this kind of treatment in any case, but especially for a small room because it will help to make things less busy and more elegant. In any case, drapes need to be hung as high as possible. Right underneath the crown moulding. I am thinking that a tailored inverted pleated valance, just long enough to cover the window frame will do the trick. Tracie says that there is 11″ between the crown and bottom of window frame, but 13″ will be a good proportion, I think and ensure that one cannot see the casing. That would be very tacky. This treatment will give the illusion of height to the eight-foot ceiling. But of course, it is still absolutely fine to do a treatment without the valance. In addition, I would paint the ceiling a slightly lighter version of the wall color. The ceiling will look lighter in any case, except close to the entrance. By painting it a pale gray-blue, it will raise the ceiling higher. And finally. I believe Tracie lives in the south so if a fan is needed, a simple white fan would be fine. Otherwise, I put in a fixture that does not come down more than about 18″. That should be on a dimmer for ambient light. One other thing I would recommend is to have a different mirror for the chest and then a lamp on low in front of it. It’s not that the one that’s there is bad. It could also be brightened up with a little gold craft paint, perhaps. I think the pretty white lamp she has on her night stand would look great and brighten up that spot. This one is the Lilou Table Lamp from Currey and Co. If you google it, there are many online vendors that sell it. It’s a little big for this room, but I like the idea. And here’s the inspiration board! I hope that helps Tracie and anyone else that’s struggling with a small awkward space. Nightstand lamp: Athena lamp from Robert Abbey. It comes in a zillion colors and is also sold online– many sources. The rug is something I made up from another rug and I found some random fabric for the bench. PSS: It’s Sunday morning at 10:40. If you leave a comment and don’t see it right away it just means that I haven’t had a chance to post it yet. Thanks so much for stopping by! Ceiling fan conundrum…I am getting ready to ADD a light to my ceiling fan in my master bedroom! I completely understand the “less than stellar” aesthetic, but my bedroom is DARK, with only two east facing windows…the closets and bathroom are on the west side of the suite…I already have five beautiful lamps, but I sometimes just want to see something in terrific light. If you HAD to add a light to an existing, flush mount, plain white ceiling, what might you select? I promise to use it only when matching socks, ironing, and other mundane needing lots of light. I didn’t know that one could add a light to a fan that didn’t already come with one. As for the rug under the bed, there are some different options but it also depends on how large the room is. But usually, I like to see at least 3 feet of rug on either side of the bed, unless it needs to be cheated on the far side for some reason. But, if it’s a large room it could be a lot more than 3 feet. Stunning transformation …….as always. I love what you did with the angled room configuration and I would definitely use that in such a situation. Why don’t designers like ceiling fans? Not being snarky — serious question. I have the exact same fan, a quality Hunter model. It’s never shut offf for 6-7 months of the year, makes summers livable, and it’s absolutely silent. Sure, there are more stylish lights and chandeliers but I’m not willing to sacrifice being able to sleep. And no, a table fan at the level of your face is not equivalent to the cool gentle breeze of a ceiling fan. I’m truly curious about why they are so reviled. It’s not the fan. Not at all. I have absolutely no problem with a ceiling fan. It’s the LIGHT on the fan. The only ones I like are retro in style, but in a traditional room, a light on a fan looks strange to me. I’m not a “fan” of ceiling lights in general, either. Unless it’s a semi-flush mount with the light being directed upwards. The reason is that ceiling lights create shadows and glare. The exception is in a very small space like a hall. In a hall, the light coming down has a chance to bounce against the wall walls thereby creating a softer light. Laurel, your humour in your posts always gives me a smile. LOVE your suggestions and totally agree with your view about using the large buffalo check in this case for the window coverings. Regarding the space behind the angled bed, I am wondering if placement of a (shaded) arc floor lamp might be another option to accommodate some lighting (other than a bed-side lamp) plus help fill the void. Just a thought. From my standpoint, I would like the space to be built in or a shelf or a triangular custom tall table. It is hard to clean back there. Love you! Just bought your paint guide and can’t wait to use it! It gives me a lot of pleasure to tell you and anyone who wants to know. And this is why. Years ago, I saw these beautiful boards on blogs and had no idea how they did them. So, I wrote to them, as you did and asked the same question. Thanks Laurel! Are you using an iPad or computer?? I agree, that an upholstered headboard would be better. One reason that the dresser looks heavy, I think, is a balance issue. That’s why I changed out the mirror for something with some interest bringing in more brown and white or cream in this case. And then a white lamp. But don’t get me wrong. I adore painted furniture. In my apartment, I have four pieces of wood stained furniture and six pieces of painted furniture. And none of the wood pieces are super big. I would say that if one has to choose a white without testing, that cotton balls is a safe bet. I hate to say always, because in design there is no always. What an elegant and ingenious transformation, Laurel! The room is stunning and a tribute to your skill and talent as a designer. I’m finishing a simple, budget priced DIY redo of my bedroom. Like Tracie, I live in an old ranch house, and my small bedroom has awkward windows. There’s the dreaded ceiling fan (a must in the South), but I installed a new fan with simple lines, nicer than most. The other constraints came from my husband — venetian blinds, no draperies, limited pillows, and keep vintage lamps and 80s Henredon night tables. Oops — they need dusting! But I did buy new Robert Allen fabrics and made DIY throw pillows, an upholstered headboard and cornice boards. 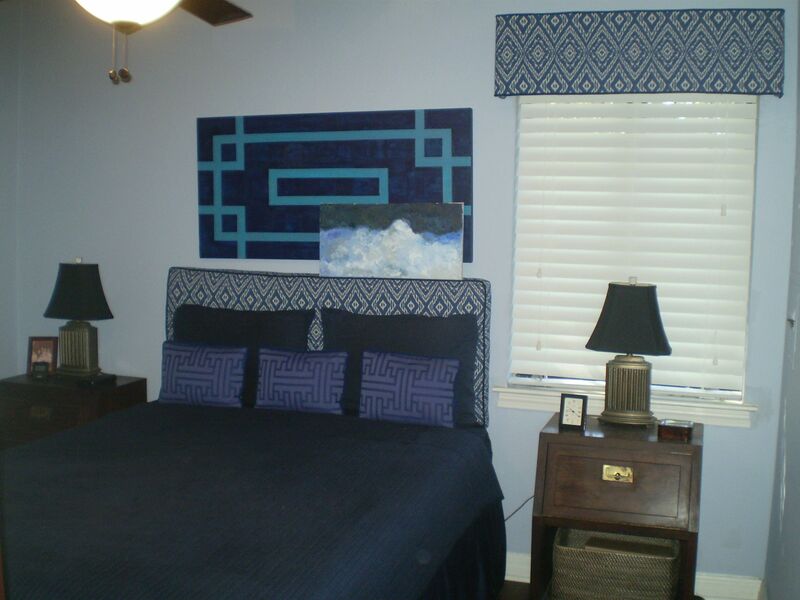 My last step will be to paint an oversized abstract cloud painting to hang above the bed. I just found this website and blog! Wonderful. I have to add a suggestion for Tracie. By the way, this is only the second time I have ever written on a blog! If you were to hang a substantial ivory linen panel on the windows, and make it floor length, you could still see through it and it would make the windows look floor length!!!!! I can’t see your exact situation, but I think this could be a stunning look. Dark colors look especially wonderful in small spaces. Definitely have at least one mirror with a lamp in front. Trust me on that one. My very first thought was REMOVE the footboard if possible. That is creating a visual block as well as taking up space. I also think the bed should be a lighter color. I know some people hate to paint furniture (I refuse to paint my Stickley bed) but this space screams for neutrals. I guess it depends on how long they plan to be in the home and what else is going on in the neighborhood. I would love to see that entire back wall rebuilt with two windows and the one by the bathroom, eliminated. Thank you so much! That’s why I thought this would be a good one. The “impossible bedroom.” You will never see this in a magazine or even on houzz or pinterest. Too funny about the pillow. Schumacher’s Bermuda Blossom designed by our wonderful Mary McDonald! Not sure if you are talking about the mood board or the original room. I have the night tables in front of the windows even though you can’t see that in the mood board. Very pretty mood board, quite, serene, casual yet elegant. I never tried an angled bed; I do have an angled sofa though, in my living. It was and is enough space to put it straight; and it was straight in the beginning. But something about it was off. Very boring. The living is open, but has this angled fireplace wall, turned into the living space, making it into this uneven shaped space that strives to become a trapezoid. (I don’t want to hem curtains though. I have 84′ inches curtains in my 9′ feet family room, and they look just right. I imagine in 8’feet room they will look even just righter lol. I think there’s something awkward with rod almost touching the ceiling. It reminds me of myself on PE lessons in school..we had to climb that rope, you know..:) I looked desperate every time. But, you touched on something interesting. It is stressful and nerve-wracking when it’s one’s own home. It is for me as well for a client, but in a different way. It is because I want to come up with the best solution for them and their unique needs, but there isn’t the same emotional component that one has when doing it for oneself. And that is an additional layer of angst. Your mock-up is showing a beautiful room. I’m not a designer but I’ve always felt a monochromatic room is a good idea for a small space. Less contrast to stop the eye from moving around the room. I know you’re letting Tracie keep her ceiling fan because of her warm climate. But I’ve seen many nice table-top fans that she could place either on her dresser or a nightstand. I just think a pretty chandelier adds so much to a room. Thank you so much. I thought. “Oh, this one will be a breeze and I’ll be all done in a few hours. Nope. Not a chance! Actually, I used the bed from the inspiration photo and the pillows were already on the bed. haha. I just added another one for fun. Bed at an angle is the only solution—I thought the same thing. But now that I’ve looked at all her pics, would it be weird to have the bed against the wall near the entrance? Love the inspiration board, and would it be too much to fill the ” angle void” with a tall faux plant? There isn’t enough room between the entrance to the room and the close on the other side on the same wall. A plant might look nice but again, it’s just a big dust catcher and difficult to keep clean. The space is awkward for sure. A table is a possibility as long as the headboard is low. Otherwise, it would be a very tall table and one would still have to get on their knees and reach over the headboard. I love the mood board too! You made a very asymmetrical room appear very balanced between the windows by putting the bed on an angle. My Master bedroom is 171/2 by 131/2 and similar to Tracie’s layout. I was just wondering, is it still ok to put my KING size bed in that corner? Thank you for your blog! I get excited when it is in my mail. That’s a good question. The more I think about it, the more I think that the corner should be filled in. In our old home there was an architectural feature upstairs and downstairs where two windows created a V, in the center of the room. Upstairs was my two boys’ bedroom. It was a nice sized room, but I needed to put two beds in it. I had one centered on the left side and one perpendicular with the V behind it. It looked great, but it was more difficult to clean behind. My son loved it too. Lying in between the two windows with the wooded hill just behind was like being in a treehouse, almost. Thank you so much for your post. I’m afraid that I don’t agree with Cynthia about the bed at an angle. While it may not be optimal sometimes the room is just too small and there are too many doors to walk around the bed. I once put a small lounge at an angle and it vastly improved the flow through a room. There are quite a few options for filling the angle such as a screen or plants. I was wondering if you considered a large drapery panel behind the bed? As the bathroom door opens in, you could then to center the bed on that wall in front of the drapes. To echo so many others, I really look forward to your posts and learn so much-balancing light and dark, scale and in this post the great professional tip about checking beige against the light! These have really upped my skill level and I look at every room in my house in a different way now. That’s a very good idea. I don’t think I would do the entire wall as I think that might overwhelm this small room. This is really the size of an average kid’s room with a single bed. So, if there was about 64″ of drapes centered on the wall, it would cover the window. The only thing is, I think it would need to be blackout as it would look funny during the day to see a square of light shining through. We will lose about six inches because of course, we need to have room for the drape to sit behind the bed. But since this window is so high up, it could be anything– a tapestry, quilty or even a large piece of art. Just as long as it’s centered on the wall and covering the random window. But again, folks hate covering up windows. What I would recommend is putting the bed in the corner first to see if it’s a viable solution for them. A bit of hassle moving it, but a good idea, I think. aah… I have just seen a door to the left of where I was proposing the bed to go. ( it’s still early here). The best laid plans of mice &….women. I am as stupid as I look, after all. Over to you, Laurel ! Whatever you do, however, Tracie, follow Laurels advice & do the Fandango. Oh, no problem! It’s the architect (if there was one) or builder who is stupid. But, I thought perhaps you meant the window on the right wall and just mixed them up. My least favourite word in the dictionary BUDGET. So, just ignoring it for a teensy tiny second here is my idea. FILL IN the window on the left. I did use the word SAVING. ( I am a hypocrite). Now, using that money she has SAVED, replace the window directly opposite as you go into the room with a Long , almost to the floor window which, unless it is looking on to a motorway, I see green leaves, will look architecturally different ( a good thing) & create a sight line ( always a good thing) from the doorway. The bed then,can, in all its majesty, lie against the full left hand wall. She is also ( ever the economist) saving money on one pair of drapes. If the bed is angled I don’t think she will ever really be happy. Personally, it would irritate me as I would always imagine a hand coming up from the deep dark lagoon in the space behind the headboard. I am a great believer in getting the BONES OF THE ROOM RIGHT before splashing out on curtains ( drapes as you say) . I think the scheme you have created Laurel is superb & as copying is the sincerest form of flattery, it may well be coming to a home near me in the not too distant future. Bravo ! Bite the bullet & splash the cash where it is needed, Tracie. One cannot make a silk purse out of a sows ear. yep, laurel it was the wall on the far Left, as you walk in, i was thinking of. (niche), the size of the original window, for books. I painted it a slightly darker tone of the wall colour ( lighter would work too). I didn’t see the cloakroom door as I was entranced by your pretty pictures. bed linen, suitcases or seldom used articles. almost make an architectural feature of the angle. That means you must be of some Anglo-Saxon origin, right? My wasband’s mom was from South Africa but the exlaws moved to Toronto. However, my MIL never lost her colloquialisms. You can keep your head. lol I’m with you 1000% about getting the bones of a room right first. And I did consider everything you suggested and more which I didn’t write about because I figured it would come up. The size of the room is an issue but the bigger issue is the windows. The suggestion to fill in one window is viable. However, breaking through masonry is mucho bucks. The way this room should’ve been done is two windows on the shorter wall of normal size (with about 3 feet in between) and nothing on the bed wall. One large window on the left is weird, but perhaps could be balanced with a larger case piece on the other side. That could work. But, they have to be willing to blow through the brick. Many years ago, before flat screen TVs were mainstream, I had a potential client consult who had a family room that was completely open (to the kitchen, natch) on one side, then a whole double story wall of windows and then a fireplace wall with two windows flanking the fireplace. Then on the 4th floor a completely open staircase running parallel to the massive window wall (with a very small wall as the stairs went up) and then the opening into the room and kitchen. I suggested that she fill in the windows flanking the fireplace so that we could put a nice TV on one side. She looked at me like I had six heads. I left about 30 minutes later and never heard from her again. Cynthia, stacking the bed and it’s accompaniments like cordwood along the wall looks makeshift and desperate well. Organized symmetry, even at an angle, gives sense and structure. My bedroom is almost identical and I also went through “angle resistance”. Then I removed my footboard, added a DIY tall, triangular storage box for off season things behind the headboard. It has supported a myriad of accessories; antique lamps, masses of small, potted trees, bundles of hydrangeas, mirrors, and the ever present “things stored in attractive boxes”. That’s an interesting idea and your room sounds charming. I can’t speak for Cynthia, but to me, it sounds like she’s not being hasty in her judgment of angling the bed. She’s seen it a few times and doesn’t care for it. However, some people like doing it even if it’s not necessary. I agree that the void is awkward. I have an idea. What if we fill in the corner so there’s no void? That is actually the shape of my bedroom. Mine has a window on the angle, but maybe there could be a hidden door to store something inside. I thought of that idea, but I like the idea of storage with a “hidden” door. It wouldn’t be every-day storage. You really are the very BEST! I love your blog and look forward to Sunday and all that you reveal! I am so impressed with this beautiful mood board that you have come up with…..and that you are sharing, because so many of us have ‘small’ rooms with 8 foot ceilings. I have had blue ceilings in other homes and just think they are wonderful! That’s so sweet Susan and appreciated–especially since someone who I have no idea who they are, felt compelled to write me to tell me that I’m an idiot. You know I am a big fan of yours (there’s a pun here) but I really struggle with the no fan with a light edict. I live in a suburb of Phoenix AZ where it is over 100° pretty much every day from May through September. Did I mention that a couple of those months its over 110° most days? We were watching a college football game on tv last night and had to laugh when the announcer said it was a scorcher at 90°. Heck, by this time of year, after having the fires of hell breathe on us for 5 months, 90° feels like fall. It rarely drops below 100 at night once we get into June, so ceiling fans are a must. With most rooms, it’s just not efficient/practical to have lighting from lamps only, and depending on the size (especially bedrooms) recessed lights and a fan create a terrible strobe effect. So it’s either agree to disagree or perhaps it’s an edict that has regional exceptions. I went with this ceiling fan for my bedroom to try and balance fan and lighting. The fan you suggested could never work in this room because we only have 8 feet to work with. In Tracie’s room my eye goes straight to that light which is also making weird shapes on the ceiling. It doesn’t give off a nice light. Ceiling light, I’ve come to realize is best confined to spaces like a hall because it tends to be glare-y and shadow-y. An exception is a ceiling light where the light bounces up, more than down. Also, I have found that the most beautiful lighting is from table/floor lamps and sconces. And maybe a small amount of ambient or spots on art of ceiling light.